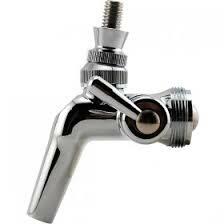 All 304 Stainless Steel faucet with all the features of the Perl faucet. With a compensator to adjust the flow. This faucet fits standard American shanks; no adapter required. The flow control compensator offers you more control because by adjusting the flow control handle, you can increase the restriction for your hard to pour brands. You can also slow the flow for pouring sampler glasses, as well as reduce the amount of foam when pouring into a frosted glass by adjusting the flow control handle.